Check your back for knives in The Creative Assembly's latest historical Total War. My kingly ego would rather overlook the fact that I failed to build any farms and presided over chronic food shortages. My decision to mint my own currency and put an imprint of my head on all the coins didn’t go down well with my Christian English subjects, who would rather see the Lord’s cross there. When one of the nobles started getting uppity, I should perhaps have taken the option to torture him rather than pay him off. In the following years the nobles came to me for bribes several times after that, and each time I caved my reputation collapsed further. As a result the reign of king Guthfrid of the Northymbre Vikings is short and violent, which is fitting considering the tensions surrounding that period. Maybe his son and heir will go on to do better, though with the name Cnut, I have my doubts. Thrones of Britannia is set in 878 AD, just after Alfred wins the battle of Edington and halts the Viking takeover of England. The proud factions of England, Scotland, Wales and Ireland enter a febrile peace, the sort that just wants to implode the second a leader farts in the wrong direction. It’s an ideal setting for one of the most experimental Total War games to date, especially for a game that’s well suited to telling stories. At a glance this is still very much a Total War game—you build up your settlements and direct armies on a campaign map that encompasses England, Scotland, Wales and Ireland, and then direct your forces in real time strategy battles when armies clash. However this game is particularly interested in using streamlined politicking and narrative dilemmas to drive your campaign in unexpected directions. The ‘Saga’ moniker fits perfectly. I enjoy the way Thrones of Britannia models these violent soap operas because they provide a deeper structure to the campaign than the traditional Total War sequence of ‘meet faction, build a few armies, crush faction, repeat’. You can appease disloyal governors and generals by gifting them one your limited number of estates – though choose carefully, if you later forcibly remove the estate, expect a tantrum. Alternatively, you can add priests to their retinue to keep them in check. If you’re sure a noble is about to rebel, or you’re just sick of them, you can always pay a lump sum to have them assassinated. Many of Thrones’ systems seem intended to force you to sit still every now and then to tend to your people. Over the course of a campaign your citizens slide up and down a ‘War Fervour’ axis. If you fight relentlessly for years, morale will slip away. Sit still too long and your people start itching for a fight. At higher difficulty levels your people will move more quickly along this axis, which forces you to read the room and indulge in efficient wars that sate your citizens’ bloodlust without wearing them out. If you wage a war in a high War Fervour state your units enjoy bonuses to their stats. Recruitment works very differently in Thrones of Britannia. You no longer purchase units fully formed from military buildings in your settlements. Instead, armies pick units to muster from a regenerating faction-wide pool of units. The unit appears in your army at a fraction of its normal size and grows to full strength over a few turns. This is primarily designed to simulate the process of assembling an army more realistically—it takes time to train and equip new recruits—but the system serves a few other purposes. Units in the pool have a percentage chance of regenerating, and the chance is much lower for elite units. This means your Vikings are almost always going to have access to axe warriors but the truly elite guard are precious resources that you don’t want to lose. Each province features a walled major settlement and a scattering of tiny defenceless settlements built up around resource features. Farms and mines are essential for the upkeep of your armies and the overall happiness of your citizens, but they are easily sacked by roaming enemy forces. Burning enemy farms is a viable tactic in Thrones of Britannia because food shortages stop armies from recovering their losses. I discover this first-hand when I counter-attack against northern invaders and run out of food stores. A desperate cluster of units, some only a dozen men strong, stumbled up the coast capturing undefended settlements as I ordered my citizens to farm harder and trade more to support the conflict. I like the way Thrones simulates some of the slog and attrition of drawn out wars, even while keeping the battles exciting. My Viking campaign would have ended much earlier if I had failed to secure an unassuming settlement called Dunholm. Sometimes in a Total War campaign one province or settlement becomes the battleground of an all-or-nothing stand on which the success of your campaign turns. The forces of Northleade lined up against my Vikings in the snow for a terrible showdown. I find Thrones of Britannia’s battles to be especially clear and readable. There seem to be fewer incrementally different troop variations, which makes it easy to assess what units are for. Clear tooltips and characterful but practical unit descriptions also help, and the game’s reliance on Attila’s codebase means it should run well on a larger range machines. At Dunholm my archers effectively used flaming arrows to deter enemy cavalry while my spearmen ‘castled up’ – a command that prompts them to form their shields into walls and a roof, turning the unit into a spiky armadillo. At a key moment my spearmen uncastled and surged forward to soak up an enemy infantry charge and I counter-charged with my long axemen. The double-handed axes cleaved through enemy armour and absolutely flattened the core of the Northleade force. After that all I had to do was chase down the general and mop up the enemy firing line. Though the game had predicted a close fight, my plan had worked flawlessly, and there was no way Northleade would be able to muster a new force quickly enough to stop my subsequent charge north. I love these moments in Total War. Normally the campaign’s long term objectives are irrelevant to me, other than as a means to generate clutch battles and neat story twists. Thrones of Britannia could change that, however, with a new series of layered objectives, including some secret ‘ultimate’ late game objectives that emerge once you’ve truly dominated the map. There are straightforward conquest victories that challenge you to secure a certain number of provinces, but you can also win a fame victory by building famous landmarks and levelling up your generals and governors. 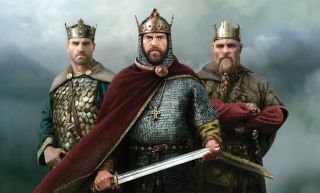 There are ten playable factions belonging to five cultural groups: Anglo Saxons, Gaels, Welsh, Viking settlers and Viking Sea Kings, and each cultural group has its own path to victory based on unification. The Scots can secure the stone of destiny, the Welsh can secure sites of legendary historical status, Alfred can unite the English into one kingdom. Once you have achieved one victory condition you can keep playing to earn more, turning all of Britain and Ireland into one kingdom under your name. At that point, you’ve won at being king. What could be more Total War than that? Thrones of Britannia is out on May 3.